A HDR from the famous Orient Express train. Exhibition in Institut du Monde arabe – Paris – 2014. After a 3 hours long walk near along the Seine river, i arrive near one of my spot for long exposure architecture photography in paris at Institut du monde Arabe. Gloups ! There is an exhibition outside about Orient Express Train and cannot shoot my long exposure. I walk around, a little bit upset. 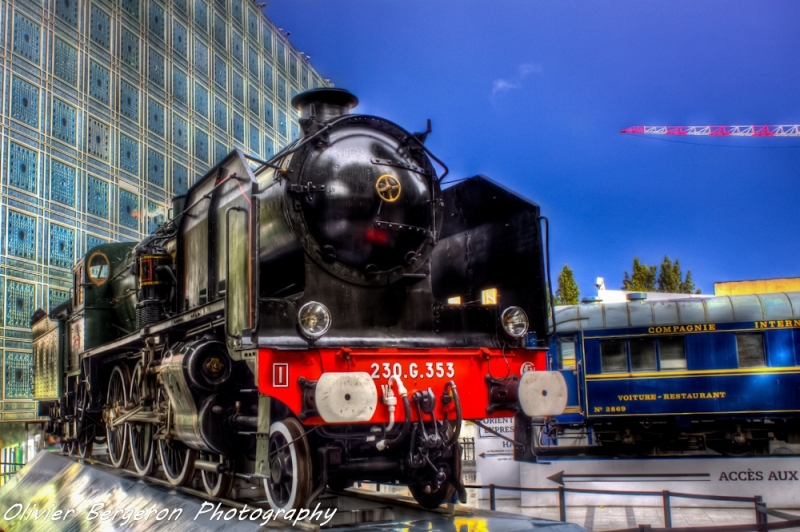 And finally, why don’t shooting a HDR photography of the locomotive of The orient express !! With modern facade of the Institut de Monde Arabe behind, i foreseen a nice effect in HDR.